Sometimes you need a homemade gift that isn’t too over the top – a token housewarming gift for a new neighbour, perhaps; a little something to say you care, or a small pick-me-up for someone in need of good cheer. This little craft project fits the bill; it also makes a nice bazaar craft for fundraising at your school or church. If you don’t have the supplies on hand, a quick trip to the dollar store will get all you need at very little cost. 1. Lay the white washcloth on a table. Fold the left side over an inch or so, then double over again, and once again if required, until the folded side meets the center of the washcloth. Repeat with the right side. 2. Fold the colored washcloth in the same manner as the white one, but make it about about one inch narrower from side to side. 3. 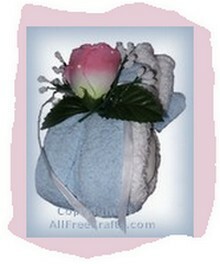 Place the soap in the center of the folded white washcloth – the sides of the washcloth should be even with the sides of the soap. Fold the bottom edge of the washcloth up to meet the top edge, enclosing the bar of soap in the middle. 4. Fold the colored washcloth over the white washcloth, as shown in our photo. 5. Secure the soap in the middle of the washcloths by tying thin ribbon around the washcloths, just above the soap. Tie the ribbon in a small bow, leaving the two ends to trail down. 6. Use just a small amount of hot glue to secure your choice of small floral accents, such as baby’s breath, in the center of the ribbon bow. Don’t use too much hot glue; if the glue spills over onto the washcloth it will be very hard to remove. 7. Finally, use another spot of hot glue to secure your main flower to the smaller floral accents.